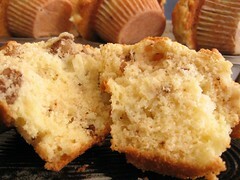 Pear, Apple and Walnut Muffins - Do You Know The Muffin Man? Notes: This issue has an article featuring a master muffin recipe with ideas for different fruit/nut/chocolate combinations. I used chopped apple and pear, walnuts and ground ginger. Cinnamon would have livened the flavour some more. The batter is quite rich (melted butter and sour cream) and tastes that way too.